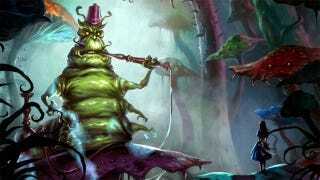 With ten-year-plus gap between the new Alice: Madness Returns and its predecessor, American McGee's Alice, maybe you could use a little refresher on what's been going on in Wonderland and in Alice's head. Good news? There's an app for that. Electronic Arts writes on the official Alice Facebook page that "in the next few days, it will be available: to international iOS users, on Android smartphones and in a Facebook app" with the catch "but not all at the same time."